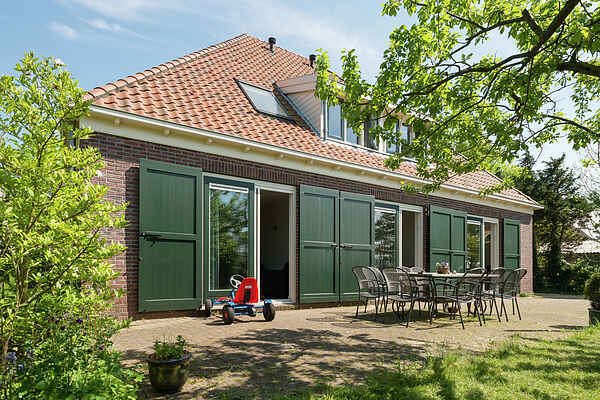 You will find this comfortable group accommodation in a 'stolp' farmhouse (domed roof) in rural south-east Beemster. All bedrooms in the house have en-suite bathrooms and TV. The long dining table in the spacious kitchen invites cosy, long meals. The Beemster is listed as a UNESCO world heritage since 1999, in particular for its unique landscape. A trip through this region with its straight roads is a must. The rural region is perfect for beautiful walks and cycling trips, but you can also explore the region from the numerous waterways. Cities like Amsterdam and Alkmaar are only a thirty minutes' drive away. The centre of Purmerend is at a few kilometres. The typical towns Medemblik, Hoorn and Enkhuizen are located around the Jjssel lake. The IJssel lake is perfect for all types of aquatic recreational activities. Pay also a visit to Zaanse Schans (12km) or historic Volendam (16km).